Listed on the National Historic Register, Churchtown Inn is a beautifully restored 18th century fieldstone mansion nestled in the heart of Pennsylvania Dutch country. As you pass through the exquisite leaded glass entrance door you will be greeted with the warm hospitality of your innkeepers, Diane and Michael Franco. The sound of the Amish buggies clip-clopping outside accompanies you as you are escorted to your spacious and lovingly appointed guest room. Wonderfully comfortable beds are dressed with billowy linens of fine cotton and lace and adorned with handmade quilts. Deluxe bath amenities and impeccable cleanliness marry today's comfort with yesterday's charm. Our cozy elegance will soothe your weary body and soul. Your innkeepers are always nearby - ready to share their knowledge of the "plain people" or help you plan your day or evening. 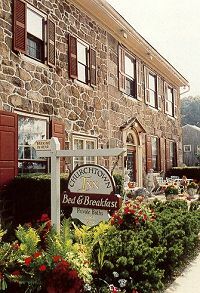 Churchtown Inn bed and breakfast is perfectly located just minutes from all attractions of Lancaster County, including an Antiques and crafts markets Amish farms and manufacturers' outlets. This and other Amish Country Bed and Breakfast Inns can be found here in The Register.